June | 2012 | Hand Luggage. Blame one of my best friends for having to have a super glam wedding in Rome! So it’s back to the Eternal City for three days, then hopping on the train to Naples, grabbing a hydrofoil and onto the gorgeous looking island of Capri for a few days of watching the beautiful people. Thenk it’s onto Sorrento to check out the Amalfi coast, Pompei and other Roman ruins! 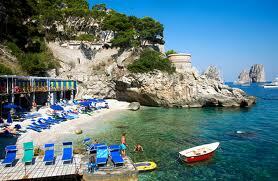 Here’s an image of Capri to whet your appetite! Expect lots more pictures of azure waters, tiny hidden coves and lush vegetation when I head back. Plus the obligatory whinging about how rude people are, how I hate flying and general grumpiness!